If you are looking for flexible, sensitive climbing shoes with loads of excellent details, then the Wild Country Meshuga is the shoe for you! The best thing about this climbing shoe is the super-sticky Michelin rubber sole. The rubber compound is similar to that of MotoGP tyres - no wonder the Meshuga provides the exceptional grip and friction it does, no matter where you plant your foot. The 3D-shaped midsole makes the shoe both extremely durable and sensitive without sacrificing stability and torsional rigidity, thus guaranteeing excellent performance when hooking or standing on smaller structures. For the upper, Wild Country has opted for micro-fibre, which hardly stretches and thus always gives you an excellent fit. Thanks to the sandwich-like construction, consisting of both micro-fibre and PU synthetic leather, the shoe compresses in all the right places and offers flexibility in others. The small air holes allow air to seep into the interior, preventing heat accumulating. Thanks to the hook-and-loop fasteners, the climbing shoe is easy to slip on and off between routes or in between pitches. The discreet pull tabs help as well. 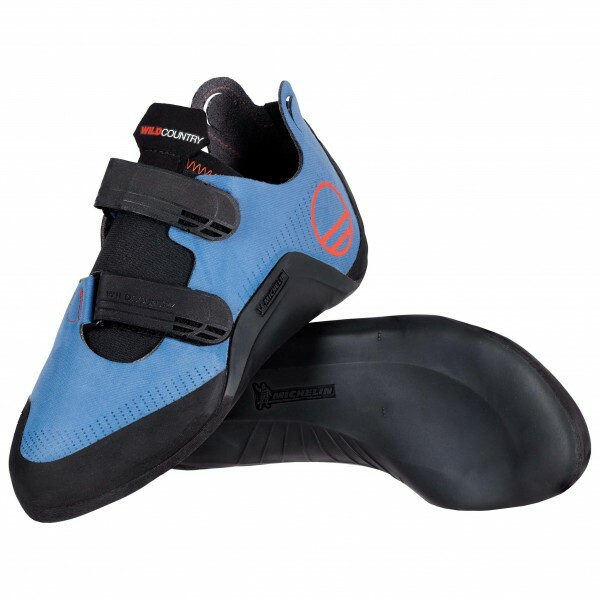 All this makes the Wild Country Meshuga an extremely versatile climbing shoe that works well for bouldering and sport climbing!